SouthBank IQ is a research study and consultation document by Images&Co that evaluates the potential for innovation-led growth in South London. 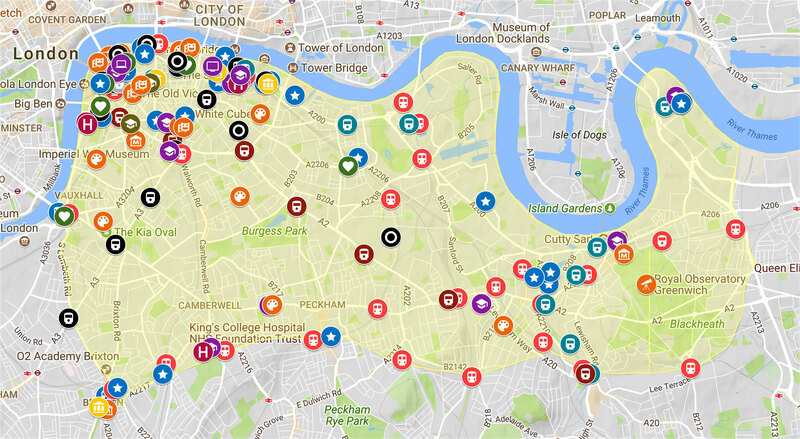 The study identifies an opportunity for a dynamic innovation partnership on the South Bank, working in tandem with neighbouring and wider networks to create an enduring ecology for inward investment and deliver wider benefits for the whole of South London. South London is historically disadvantaged in terms of transport connectivity and investment, and has suffered from ill-founded perceptions of not being at the heart of the action. The political case for a balanced economy, reflected in the UK Industrial Strategy, has in part been fuelled by an awareness of disparity between London and the rest of the country in terms of government investment. This has given rise to initiatives such as the Northern Powerhouse, the Midlands Engine and the city devolution settlements. 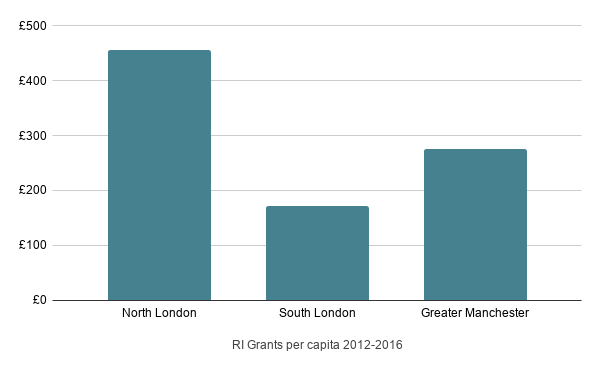 Research carried out for this report, however, shows that in terms of public funding for research and innovation from all seven Research Councils and Innovate UK combined, over the five years from 2012 to 2016, the stand-out beneficiary (both in absolute terms and per head of the population) is North London, while South London has actually fared worse than Greater Manchester. This is reflected in some measures of lower productivity. In the Mayor’s London Plan, the projected growth in jobs and housing over the next decade is significantly lower per head of the population in the South than the North. If this imbalance could even partly be redressed, it would help tackle some of the capital’s most pressing problems. Yet South London has some very distinctive strengths. Economically and on most other measures, Southwark has long been one of London’s top three boroughs alongside Westminster and Camden. In terms of knowledge economy jobs, Lambeth and Lewisham have also risen to the top tier. The corridor between Vauxhall and the Millenium Dome along the South Bank is extraordinarily rich in innovation assets, with eight higher education institutions and research centres, three academic hospitals and dozens of cultural institutions with seven global leaders among them. It has a well distributed and connected network of accelerators, incubators and coworking spaces, and a strong presence of specialist and industrial innovation businesses in construction, architecture, energy, transport, communications, technology, media and more. This ecology is supported and connected by a network of more than half a dozen community and business organisations and four collaborating borough authorities. The sector and discipline strengths within this cluster include arts and culture, media and creative technologies, medicine and healthcare, transport and mobility, built environment, energy and engineering, education and skills. There is a promising foundation for fostering an innovation partnership in that corridor from Vauxhall to the Dome, down to Lewisham and across to Brixton. In addition to the innovation assets already present in this cluster, the corridor has eight Opportunity Areas in the Mayor’s London Plan, six of which are active and projected to deliver 57,000 new homes and 38,000 new jobs between them by 2036. The proposed extension of the Bakerloo Line runs right through the centre of the corridor to Lewisham and two new tunnels are planned. Together with the Northern Line, the Jubilee Line, the DLR and overground services, this part of the capital is already well connected and will be significantly more so in the coming years. The aim of an innovation partnership is to attract inward investment with a sustainable long term proposition. We believe this is best achieved by building on acknowledged strengths with a vision that does not constrain future development. It would be wrong in this location to focus on one sector, such as Medicine, or Engineering, or Media, at the expense of others. There is great potential for cross-sector innovation between all of them in a way that adds up to an attractive ecology for inward investment. We conclude therefore by defining the vision as smart innovation within and across all the areas of excellence: SouthBank IQ, smart innovation in London. This is in our view best developed through a focused but flexible partnership mechanism that supports and does not seek to replicate the work of any of the partners, encouraging contact, looking for connections and overlaps that have the promise of propositions worthy of investment. SouthBank IQ is written by Kasper de Graaf with additional research by Itua Omokhomion, Alice Magagnin and Elena Ware. Get involved / stay informed by emailing here.